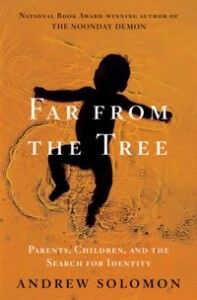 JOE WENKE: Far From the Tree addresses a profound question: Is difference the foundation of human identity, even if the difference-making element is a disability or is widely denigrated or pathologized? In your opening chapter, “Son,” you make an extraordinary connection between your experience growing up gay and people who are deaf, which establishes the thesis of the book. I was wondering if you would talk a little bit about how you made that connection. ANDREW SOLOMON: In about 1994, my editors at The New York Times Magazine asked me to write a piece about deaf culture, and I was very taken aback. I thought of deafness as a disability and had no sense of it as a culture. Then I went into the deaf world–to deaf theatre, deaf clubs, the National Association of the Deaf meeting, the Miss Deaf America contest—and I came away thinking this is a culture, and while it’s not my culture, it’s a very beautiful culture. There were moments when I thought, “Gee, it would be fun to be one of these deaf people and part of this world of people united by the shared use of sign language.” Then I discovered that most deaf children are born to hearing parents and that those parents have tended historically to emphasize oral skills―the ability to lip-read and to use oral speech as the center of what their children should do. As a result, many of those children don’t discover deaf culture until their adolescence, when it comes as a great revelation to them and they finally have a sense of what their identity is. And it just struck me that that trajectory so paralleled the experience of gay children who are mostly born to straight parents who think that straight lives are in general happier than gay ones and who often pressure their children to conform to the straight world―with the result that the children discover gay culture only in adolescence or thereafter when they are very much liberated by it. And so I saw a real closeness between those two experiences. JW: What’s striking to me is that relatively few people with the ability to hear would say that hearing is essential to their human identity, although hearing is certainly part of what makes us human. But as you point out, a deaf person may well view their deafness as essential to their identity and as the identifying element of their participation in a culture. What is it about difference that makes it so definitive of our core beings, of our human identity? AS: Well, I think the ways in which we correspond to the mainstream, to the dominant part of society, are less noticeable. They don’t define our identity, because identity is born by the ways in which you are specific and particular and different from other people. So I think anything, either positive or negative, that’s different will become your identity. JW: Difference is clearly the foundation of identity, but at the same time, differences can form the basis for bigotry and discrimination. AS: Yes, I think people are frightened of difference, and therefore it often does form the basis for exactly that―bigotry and discrimination. JW: In the book you share so many stories of how families respond when they have children who are different. Many of the stories are both inspiring and heartbreaking. What would you say you learned about family in relation to your own experience as a husband and a father? AS: I formulated the idea that there are different kinds of identity: vertical identities that get passed down generationally from parent to child, like ethnicity and nationality, and horizontal identities that we have that are different from our parents. I think the experience of looking at different kinds of horizontal identities has informed my fatherhood, giving me the sense that my children are not going to be a mirror image of me. They’re going to be their own people. They’re going to be separate and distinct. Part of the process of fatherhood has to be to change your children. You have to educate them. You have to teach them manners. You have to instill moral values. But part of the process of parenting is also to celebrate your children for who they are. And I think I’m awake to the need to identify who they are and to help them feel good about it in a way that was deeply formed by all of these experiences, by the experiences of many parents who were faced with children who in the abstract they would have thought they couldn’t love but who then manage to rise to the occasion of loving them. JW: One of your chapters focuses on transgender people, and of course being transgendered is not a disease or a disorder, despite being pathologized by the medical community, as homosexuality once was. As you make clear in the book, identity is self-validating. We’re all entitled to the tautology of identity. And yet transgender people are among the most denigrated and marginalized people on the planet. Why do you think that being transgendered creates such a deep, visceral, negative reaction in so many people, and as in fact homosexuality still does as well? AS: I tried to investigate that as I wrote the book, and I was astonished by the level of hatred that the trans people I interviewed had been subjected to. It was truly appalling, and some of the stories in the book are really heartbreaking. I think that people are most comfortable when the world is orderly. I think there’s the sense that when you begin questioning basic distinctions, such as the distinction between being male and being female, it represents a threat to the social order. And I think most people are at some level insecure in their own gender identity or in their own sexuality and that they therefore find it very difficult to deal with people who are different. I also think that people target those whom they perceive to be different and weak. Historically people who are trans have not had enormous power. People who are gay have not had enormous power. JW: To some extent it’s an opportunistic attack on the vulnerable, the weak, the disenfranchised, the marginalized. JW: But do you also think that moral judgments about homosexuality, or for that matter being transgendered, though they’re often justified by religion, might actually be motivated by a desire to eradicate difference, while championing a kind of tyranny of the norm? AS: I think there is a tyranny of the norm. It’s no coincidence that the most effective attack on gay people was when they were targeted during the Third Reich. Hitler went after gay people as much as he did after the Jews. So there is a sense somehow that people think that you can purify a society and that it will be stronger. But actually what science indicates is that diversity is what makes a society stronger, or a culture, or a species. Diversity is what actually leaves people best adapted to pursue the things they need to pursue in life. Very thought provoking book with real heart.